The Best Accommodation on the Island and Well-Priced Entry went without a hitch and the condo was in perfect condition and as pictured: impeccably appointed, quiet, exceptionally clean, and very well located. The layout is well thought out, the beds, bathrooms, and kitchen comfortable and well-appointed. The kitchen also had paper goods, coffee, and useful condiments. I even didnt need to pack my chefs knife. My husband thoroughly enjoyed the spacious lanai, where he could check the surf through binocs with a refer of Kona ale at arms reach. I loved everything. Not to overstate things, but the world dropped away and we found ourselves in a state of bliss. I was looking for a place for my husband to de-stress from a very demanding job, and your condo was the perfect remedy--it was not only absolutely stress-free, we were surrounded by tasteful luxury and beauty with not a thing to fix! The nearby gourmet market was a real find. The prices were acceptable and the selection rivals Bristol Farms and Whole Foods. I found all the specialities I usually trek over from the mainland and an excellent selection of sushi, fish, meats, produce and wine. I was especially thrilled to find several cuts of local pastured beef. We saved a considerable amount making use of the lanais bbq. Our check-in, check-out, and refund of deposit went without a hitch. Parking was secure and well-located, the beach gear in the storage locker very appreciated, the clubhouse and pools serene, clean, and beautiful. Immediate access to the Kings Trail was a real bonus as we could walk for miles and encountered new views all along the way; Im glad we packed old running shoes as they were shredded by the time we left. Down the beach, we found a real jewel in the Lava Lava Bar and Grill, which serves very good food and cocktails under roof, on the patio, and on the sand! It was very convenient to be able to rent paddleboards a stones throw from the clubhouse. We spent a relaxing day at A Bay spotting turtles, and one even crawled up the beach to take a look at us. In mid-October, the air and water temperatures were divine, the trade winds blew most of the week, and the Ironman crowds were gone. Years ago I lived on Maui and Oahu and the BI has gained the aloha they have largely lost. In visiting the BI six times in the last three years, this property is by far the nicest and best situated and is now our first choice. I honestly cant think of one negative thing to say about the condo, management, or locale. Quit looking at other places to stay--this is it! We had a fabulous time! After staying you will most likely ask the same question we did, how do we arrange to purchase something like this, or how long will it take us to come back. We were welcomed with a gift basket along with a very nice bottle of champagne that Alan surprised us with after Id casually mentioned that my wife and I were celebrating our 25th wedding anniversary. I received a fast response after inquiry, had great follow up with property management, everything exceeded our expectations. We have used VRBO properties several times and highly recommend this location. Besides the outstanding accommodations we had a ball on Hawaii the Big Island. Seriously, quit reading reviews, comparing prices, and weighing options. This place has everything you will need, BOOK IT NOW! WOW! What a gem!! My wife an I just stayed at this Kolea home for the first time and found it exceeded our expectations in every way. It was spotless and far more equipped than any other home we have visited. Alan, the owner, fell all over himself to make sure we had a great stay with restaurant suggestions and even quiet beaches where we could avoid the throngs. The Kolea community was pretty full when we arrived and concerned us that it would be noisy. Not so!! Though there were quite a few children the buildings are well built so that we had no disturbances from neighbors. The beds are super with a solid foundation that does not move. What glorious sleeping we had, far better than home. Our restaurant experiences had high highs, and low lows. We always like Roys and Mauna Lani Resort but also found a really authentic fish-monger at Bite Me Fish Market in the Kealakehe harbor just North of Kona. They also sell just-caught Marlin very cheaply. In the spirit of authentic Hawaiian food, Hawaiian Style Cafe in Waimea, a 20 minute drive, was a treasure. But on the low-low side we visited the beautiful, charming Lava Lava Beach Club just down the beach our first night and had pretty good drinks at the bar, abominable service and dreadful food. Go there for drinks and the killer beach-front location but dine elsewhere. We were so wise we even went back to give it a second try and is was actually worse!! The cabins are cute by style over substance. Some of their guests were complaining loudly at the service. But that was the only smudge on our trip! This is really the only place to stay in Waikoloa, in our view, and we plan to return to Alans home soon. 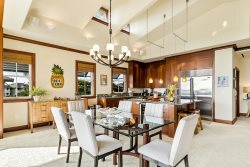 Amazing property - best condo weve found in Hawaii My wife and I almost always rent condos when we travel, and more often than not, there are aspects of the property that end up being misrepresented in the description. Well - for the first time - we actually found a condo that EXCEEDED our expectations in every possible way. First off - the condo looks EXACTLY like it does in the pictures - modern furniture, comfortable and most importantly CLEAN. I have never stayed in a rental property that was this clean before -- and that in and of itself made it worth every penny. Secondly - most condos usually have plates, pots/pans, glasses etc - but they are usually very worn in, slightly dirty from over use, and mismatched. This kitchen was FULLY stocked...it had more clean, brand-new accessories than I have at home...I couldnt believe it. There was even a washer / dryer. Lastly - location. On the Big Island, there are very few condos - and hotels for that matter - that are on great beaches (you cant even go in the ocean in front of the very expensive Hilton down the street!). The Kolea complex is on one of the best, most picturesque beaches in Hawaii....and all you have to do is walk out your door. No driving needed. There are also shops, grocery stores and restaurants all within walking distance. It could not have been more convenient. If you are looking for a clean, spacious, fully-functional condo on a great beach - look no further. Great family time in Hawaii - This was the perfect property for both my elderly mom and young baby. The unit was modern, clean, and well furnished/equipped. We had a fantastic time there. The local agent, Wendee, really took care of us and accommodated a couple of last minute requests. I highly recommend this unit. Great Place - We enjoyed staying at your condo. It was well stocked and ready for our comfortable stay. Absolutely love the Waikoloa area. Absolutely amazing condo and visit. Everything was perfect. After our first week in this gated community, we were lucky to be able to stay for two extra days in this luxury 2 BR Unit. It is part of a very quiet gated community, and is in excellent condition. The unit was modern, fully furnished, and very clean. Amazing Ocean Club (pool, sand bottom hot tub, restaurant and bar). Convenient to shopping and public sand beaches. Property Management is great to work with. Very responsive. We loved our stay. This is a luxury 2 BR Unit in a gated community, very quiet and in excellent condition. The unit was modern, fully furnished, and very clean. Amazing Ocean Club (pool, sand bottom hot tub, restaurant and bar). Convenient to shopping and public sand beaches. Property Management is great to work with. Very responsive. We loved our stay. The property was all that we expected and the description and virtual tour that we watched before making our choice was very accurate. We liked the location of this property and its close relationship to the tennis courts and the pools, which were both very nice. The grounds surrounding the location and property are exceptional and very pleasant. The location is within walking distance of the Hilton Hotel and we liked this very much. The service we received from Wendee was exceptional and very responsive to our needs. We definitely would come again. I really enjoyed staying at this unit. It was so clean and beautiful with wonderful amenities. I would highly recommend this unit. Thank you so much for everything that you did for us during our stay. We have never had such great care given to us when renting a condo in Hawaii. We appreciate the (plastic outdoor use) dishes that you purchased when we mentioned that we needed them. We used them several times every day, so thank you! We were more comfortable using them outside too and having something to take to the pool was nice also. The pack and plays (rentals) where do I begin. The rate was fabulous and you went above and beyond picking up foam mattresses for our babies. I cant tell you how much I appreciate all that you did. We will be recommending you to anyone that is going to the Big Island and also anyone that is looking for management assistance. I hope that your business continues to be successful! When we arrived, entry went without a hitch and we found the condo in perfect condition. We were thrilled that as I supposed, it is impeccably appointed, quiet, exceptionally clean, and extremely well located. The layout is very well though out, the beds comfortable and well-appointed, as were the bathrooms and kitchen. We appreciated that the kitchen had paper goods, coffee and some condiments. My husband thoroughly enjoyed the spacious lanai, especially that he could check the surf through our binocs with a refer of Blume Moon and Kona Ale at arms reach. I loved everything. Not to overstate things, but the world dropped away and we found ourselves in a state of bliss. I was looking for a place for my husband to de-stress from a very demanding job, and your condo was the perfect remedy as it was not only absolutely stress-free, we were also surrounded by luxury and beauty with not a thing to fix! Everything OK!!! Everything as new, well and lovely furnished Wonderful ocean front clubhouse, on-site restaurant, pool-side bar, and unique sand-in spa. the listing description accurate regarding the location. The listing photos accurately reflect the rentals appearance and amenities. The property was clean and well-maintained. The owner was really helpful in answering your questions or concerns. We recommend this property. Nearby activities, attractions and restaurants recommended: Waikoloa is a lovely place to stay and as start for the visit of the whole island. There is a lot to see (Volcano, Mauna Kea, the island by air, round trip of the island by car.). It was a wonderful stay for us! Our family of two adults and two children had a great experience staying at Kulalani 2001 this Sept for two weeks. The unit felt new, clean and spacious and had most of things we were looking for to make our stay really enjoyable. The kitchen had everything we needed no surprises nice. The location was quite good for all that we wanted to do and see. Pools at the complex were perfect for play and for lap swimming. The various owners at the complex were extremely friendly/helpful. The coolers, chairs and boogie boards at the unit were much appreciated for our many trips to Hapuna beach. The property manager was extremely helpful and responsive before and during our stay. The listing and the photos for this rental were as we expected. Little things that could be improved, and they are quite minor a second BBQ tank as we ran out of propane, the snorkel kits at unit were nice but missing an item or two, a few more family games in the unit would be ideal. When we come back to the big island we will want to stay at this same rental unit !!! We enjoyed swimming with the dolphins thank you Jenna/Amanda from Dolphin Discoveries. We took Surfing lessons from Austin at Kona Surfing Co what a great teacher ! Hapuna beach was our favorite place to enjoy sun, boogie boarding and snorkeling with turtles. We were told the Waikaloa Resort Luau was the best on the island and we 100% agree. The Ike Trail hike at Kilauau volcano was a highlight for us. And seeing the starts from the top of Mauna Kea is something we will never forget. Why stay and pay for a 5 star hotel when you can stay here with all the amenities you need? The condo was immaculate, well decorated with high end kitchen appliances and all the accessories you need to have a nice BBQ with friends and family. Yes, they even had a rice cooker which we did use! The big screen flat TV in each of the bedrooms and living room were convenient for all. Although we brought our own snorkel gear, we had access to the boogie boards, beach umbrellas, chairs, extra snorkel gear, cooler bags and cooler which all came in handy when we explored all the beaches between Black sand beach to Hapuna Beach. We didnt have any little ones but there were beach toys for kids too! The A Bay was not far to walk to with the jacuzzi/pool close by also. We were able to watch the fireworks from the jacuzzi which was a very beautiful night. The lanai was a nice to sit, hear the tropical birds and have Kona Coffee in the morning. I would recommend going to the KTA grocery store in Kona or Waimea since it is less expense than the Queens Marketplace. The condo did have a few essentials available so you dont have to buy big bottles of (soy sauce, ketchup, salt, pepper, oil, olive oil, marmalade, etc). I use to say I want room service or go out to eat when I go on vacation but the convenience of warming up leftovers from Roys, or having a cold drink anytime outweigh staying in a one room hotel suite. If you miss the hotel scene, you can always walk across the parking lot to the Marriott. We have been visiting the Big Island every year for the last 4 years but there is always plenty to do on the Big Island. We went golfing, drove to Hilo, visited the volcanoes, shopped, explored the beaches and ate the local foods in Kona. We will definitely come back to Kolea 15J and recommend it to everyone. This was the very first time I used this site to rent a condo and the description and reviews helped me make the decision to go for it. The owner and the on site manager, Wendee made the process easy and convenient, alleviating the stress of planning a vacation. Wendee provided detailed instructions prior to our arrival and a detailed binder full of information was available in the condo. Mahalo! Shaka! Love the Big Island. Our stay at Kolea was amazing! The unit was wonderful. Every attention to detail. Spotlessly clean. You walked in and felt instantly at home. We have traveled the world and stayed in many beautiful places. This to date is now our favorite. Wendee was wonderful to deal with. No detail was overlooked in this beautiful, well furnished, clean villa. The villa was very spacious and had the top of the line furnishings, artwork and appliances. The disappearing mahagony sliders opened up the villa to the outdoors on the lanai. We were close to the best beaches, delightful dining in Waimea, and main sightseeing locations. This was our third stay in as many years at Halii Kai. We have stayed in this Owners other unit in the past, and this new unit of his was also fantastic. Everything was brand new.The unit was very clean and well stocked. We couldnt have asked for anything other than more vacation time to spend there. We look forward to our next visit, hopefully this summer! Paradise in paradise! We totally enjoyed our stay at Kolea 15J. The accommodations were perfect. It is beautifully furnished, super clean and very roomy. The kitchen is fully equpped and the lanai has a large grill to barbecue. If we didnt feel like eating at home, it is a short walk to some excellent restaurants. It si also a short walk to both the pool and the beach. If you dont feel like making the effort to walk anywhere, the lanai which is on the top level of the building provides amazing views of the mountains and a lovely breeze all day long. In addition, Wendee who works for the rentals made the extra effort of delivering a cell phone to us that needed to be delivered during our stay. We are looking forward to vacationing there again soon. We found 4F to be a great, well equipped and well maintained unit. One of the best, if not the best, views in Waikoloa. We had two minor issues and Wendy was on top of it. Highly recommended. Wonderful stay in great Townhouse. My wife and I returned from Hawaii on February 14 2012, after a wonderful five week stay in 2001. The accommodation is perfect for a couple but could easily accommodate two couples. It is ideally located close to the most peaceful swimming area/s ( separate childrens and adult lap pool) that we have ever experienced in Hawaii. It also has a fully equipped and fully air conditioned work out room if you feel energetic. The Town house is very well equipped for cooking and dining at home and is within easy walking distance of the local grocery store and a short drive to the gated private beach. The new owner showed great concern for our comfort and enjoyable stay and there is a local Manager always ready and willing to help if need be. We certainly hope to stay at 2001 in the future and would certainly recommend this property to friends without hesitation.